At the Milford Garden Club meeting on Monday, July 11th, Lynda Zukas of Churchill Gardens in Exeter, New Hampshire led us through the process of assessing the demands of our time and the needs of our property to come up with a plan that is well thought out, but not too overwhelming to execute. Lynda has been at Churchill Gardens since 1989 and is their Annuals Manager and Container Designer as well as doing some marketing. Like many small businesses, she says she wears many hats. She has a degree in horticulture from the University of New Hampshire. Churchill Gardens, which is fifty years old, is currently owned by David and Diana Kirkpatrick, who is also an artist. They have five growing greenhouses and host special events such as the Spring Open House on March 23 & 24 (hopefully, the snow will have melted somewhat) as well as an Easter Egg Hunt on the day before Easter, March 30th. Lynda says you can create an oasis no matter the location using interesting colors, textures, and multiseasonal interest for your business, home, or public areas such as traffic islands. First, determine the style you want based on the style of the business or home – Is it Colonial or Contemporary? Look through gardening books, website, and magazines such as Fine Gardening for ideas and advice. How much sun and shade does it get? Full sun is when the area gets more than six hours of sun. If it gets shade, is it all day or part of the day? Does it have sandy or clay soil? It’s vital to have good soil to start with. You need rich, organic matter with compost for moisture retention. With all the composters available, it’s fairly easy to make your own using kitchen scraps and plant refuse from the garden. If the area gets intense sun in the morning, it may need watering by noon. How much time and effort are you willing to put in? Color – this is very subjective; you can use paint chips or crayons to play with color schemes; if the area is in front, be sure to coordinate with the color of the front door or house. Green is a calming color – you can play with different shades and textures. Size – the area doesn’t have to be large – a 10 x 10 space is fine. You can put a container garden in the middle of a small green space. Fourth, take pictures of the area at different times of the day and from different angles. Lynda says, “pictures tell the truth” and can allow you to notice details that might otherwise escape your notice, such as what’s behind the area. Also, it’s helpful to take pictures of other gardens (such as on a garden tour!) to get ideas of what you can do with your area. Fifth, put your ideas on paper and take measurements so you can draw the exact shape and dimensions of the area for plant placement. What is a particular plant going to do? Is it a focal point or a filler? Is it an annual or perennial? Does it have four season interest? Even though you like the plant, will it actually work in this area? - Summer Wine Physocarpus, which offers foliage and form in winter. Effective in a mass planting with hydrangeas. 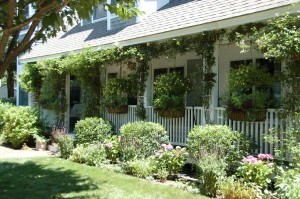 Roses and hydrangeas planted in mass can add drama to curb side area. - Sedums, which come in lots of colors and textures; good for holding a banking on a hill; however, voles do like to eat the roots. - Hostas, the variety Empress Woo will be full size in just a few years. - Grasses, which you can use as fillers or as a back drop or as a fence with a neighbor. Available in a variety of colors and textures, they make for a low maintenance garden with high visual impact. While they suffer from few diseases or insects, they need at least a half day of sun. For a low maintenance border, start small and add plants gradually aiming for simplicity. Plant in clusters of 3′s and 5′s. Keep plants that need deadheading and pruning together. 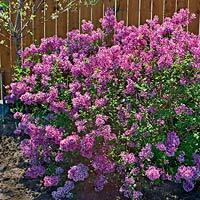 If you don’t like to deadhead, pick plants that don’t require it such as astilbe, false indigo, or Joe Pye Weed. For a herbs & vegetable border, raised beds, trellises, and bush varieties of plants allow you to grow quite a few plants in a small area while at the same time being attractive. I saw examples of this “edible landscaping” at the Munjoy Hill garden tour in Portland, Maine where the houses had very limited space but the owners were imaginative in how it was used. Herbs and vegetables were artfully mixed in with flowers. Lynda cautioned to be aware of the different fertilizer needs of vegetables and flowers. 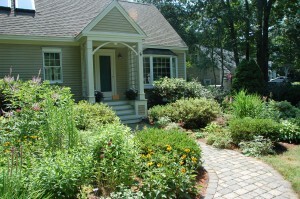 For borders with annuals, planting in masses can provide a great impact of color. In the past five years, I’ve noticed a considerable increase in the variety of high-quality annuals such as Proven Winners. They last a lot longer than the standard variety that we’re used to, especially in petunias, such as Suptertunia and Wave Petunia. Even though they are more expensive, in the long run they save you money because you need fewer of them and they last throughout the season as opposed to petering out in August. Plant these in large beds using just a few plants. A repeat of color can draw the eye through the garden to the front door or to the back of the house. 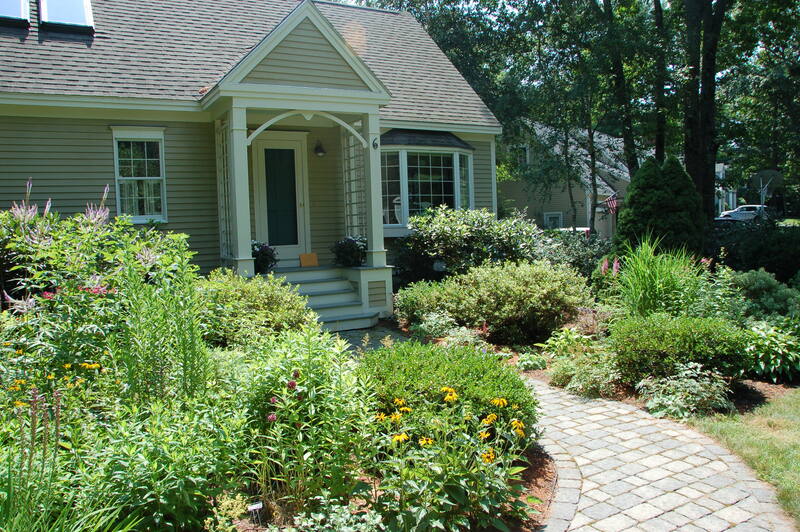 For front yard appeal no matter the type of border, you want the area to feel cozy. Add a bench along the path. Use plants of different heights and textures. With these you can use them on their own or to complement a garden border. They can add height and interest as well as a focal point to a garden or a sitting area. By switching out plants from spring to fall, you can add seasonal interest to a garden. In the summer, you can use house plants such as caladium, ivy, ferns, and palms in containers on the porch. 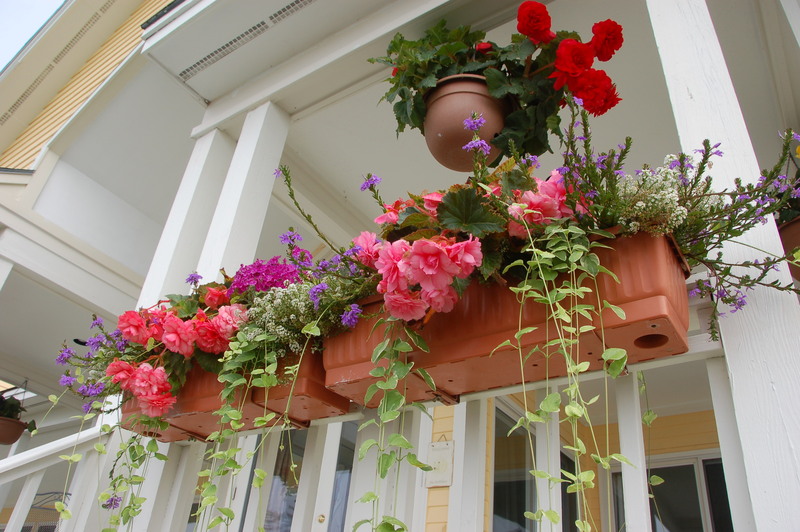 For window boxes, Lynda suggests caladium, new guinea impatiens, fern, and begonias. I have had particular success with tuberous begonias. I start the bulbs indoors in large pots near a sunny window in April and then transfer them to the window box at the end of May where they come into full bloom by late June and continue blooming until well into September and October. They have height and great color. In the fall, I then let the plants dry out indoors on newspaper. I then transfer them to a large plastic covered container filled with peat moss and store in the basement where they stay until the next year. I have saved a great deal of money by using bulbs instead of buying new plants each year. 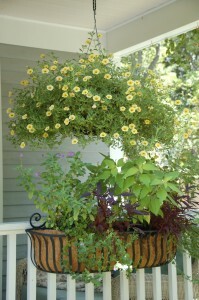 For early color, I plant scaevola, alyssum, and ivy as a trailing plant in front. 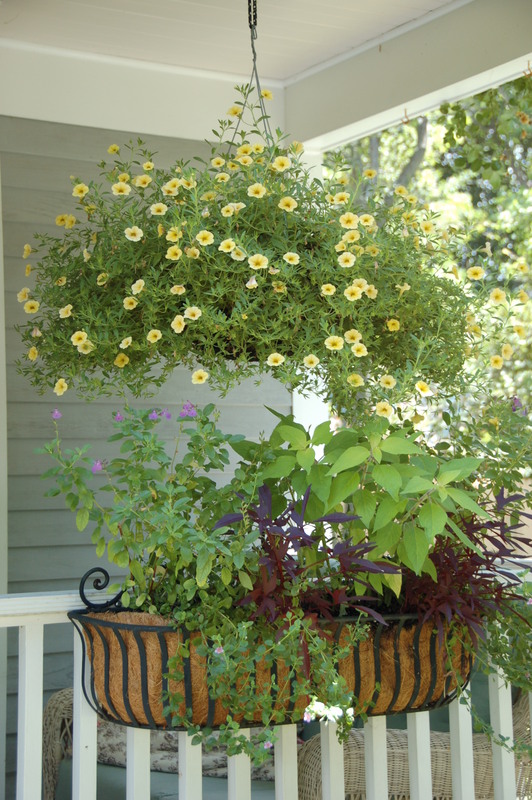 Plants for a fall container or window box include mums, ornamental cabbage and kale, cool tolerant annuals. If you use fall pansies, the plant comes up again in the spring for early color. For winter, plant a classic container with greens and berries. But be sure to remove them when they are spent. Throughout the season, take pictures of what worked. Note what didn’t. Go through gardening magazines, books, and websites as well as seed catalogs for ideas for next year. Lynda made us aware of a recent problem with impatiens (but not New Guinea impatiens or Sunpatiens). A downy mildew disease has come up from Florida; the mildew likes high humidity and cooler nights. You can treat the area with fungicide. Since it gets into the soil, do not plant there the following year. Lynda said many nurseries including Churchill Gardens no longer sell them. They also don’t sell Oriental lilies because of a ladybug infestation. 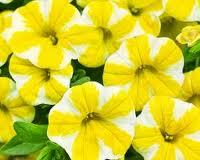 Replacements for both are begonias, coleus, torenia, lobelia, browalia, New Guinea Impatiens, and Sunpatiens. Finally, do not put diseased plants in the compost! Bag it and dispose.